BSE-listed Info Edge (India) Ltd, the company behind the popular recruitment site Naukri.com and real estate portal 99Acres.com, has informed the stock exchanges of two proposed follow-up investments on Thursday. 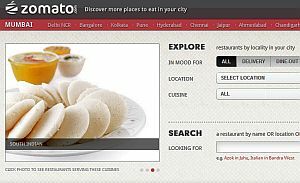 It plans to invest Rs 13.5 crore ($3 million) in Gurgaon-based DC Foodiebay Online Services Pvt Ltd, which runs the restaurant directory site Zomato.com and Rs 20 crore ($4.3 million) in New Delhi-based Applect Learning Systems Pvt Ltd, which runs Meritnation.com â€“ a portal offering learning solutions in the K-12 segment. The Zomato deal is an all-cash one while the Applect deal is a mix of equity and convertible preference shares. Info Edge has invested a total of Rs 11.5 crore in Applect in two rounds of funding â€“ Rs 6.5 crore for 40 per cent stake in 2008 and a follow-up of Rs 5 crore in May 2010. Applect is a subsidiary of Info Edge and offers content development services for the education sector. It also runs Meritnation.com, that currently has 18 lakh registered users, of which 85-90 per cent are active. The funds will be used for furthering the company's content development, hiring, marketing as well as new product development. Pavan Chauhan, co-founder of Applect told Techcircle.in that these products were still in the conceptualisation stage. So far, Applect has been involved in increasing the depth and breadth of its educational content covering classes K-12, all subjects and syllabi of key educational boards. Applect employs 160 in one office, and is adding 50-60 people in next quarter. "We are quite happy with the product, the team, the content they have built and the interest from publishers in their solutions," said Sanjeev Bhikhchandani, Founder and Executive Vice Chairman, Info Edge. Other subsidiaries include Naukri Internet Services Pvt Ltd and Jeevansathi Internet Services Pvt Ltd, (which own the domain names for Naukri.com and Jeevansathi.com respectively, as well as related trademarks, while operations are under the parent company), Allcheckdeals.com, Info Edge (India) Mauritius Ltd (set up to make overseas investments) and Info Edge USA Inc.
With these two announcements, Info Edge's investment activity in start-ups continues to build momentum. It had already invested Rs 9 crore in Mydala.com, run by Delhi-based Kinobeo Software Pvt Ltd, and Rs 10 crore in Policybazaar.com, which is a part of Etechaces Marketing and Consulting Pvt Ltd. In May 2011, the company announced an investment of $3.5 million in online private sales portal 99labels.com. It had also invested up to Rs 1 crore ($250,000) in Noida-based Nogle Technologies Pvt Ltd and is now looking for domestic mobile apps start-ups. Info Edge had witnessed 4.7 per cent fall in standalone net profit sequentially to Rs 25.61 crore for the three-month period ended on June 30, as an exceptional item that propped earnings in the fourth quarter ended March 31, 2011, was missing. However, net profit rose 48.3 per cent, compared to the first quarter of the last fiscal, led by impressive revenue growth. The Internet company had recorded a net profit of Rs 26.89 crore in the previous quarter and Rs 17.26 crore in the same quarter last fiscal. This is Info Edge's second round of investment in Zomato. In August 2010, it had invested Rs 4.7 crore ($1 million) in what was Zomato's first round of funding. The capital was used to fund the start-up's product development, sales and marketing efforts. The fresh round of funding will be used to ramp up its employee base and open more offices. However, the promoters continue to hold a majority share in the company. "Zomato.com is one of India's fastest-growing consumer Internet portals. The satisfaction levels on both sides of the value chain (consumer and merchant) are very high â€“ a testimony to the great product made for the consumers and the value seen by the merchants. We see immense potential in their current model, in their future plans and in the capability of the team to execute it well," said Bhikhchandani. Over the past year, the company has grown its reach from 7,000 restaurants in five cities to 18,000 eateries across 10 cities â€“ Mumbai, Delhi-NCR, Kolkata, Bangalore, Pune, Chennai, Hyderabad, Ahmedabad, Jaipur and Chandigarh. Compared to last year, Zomato has seen a rise in traffic from 1.5 lakh to over 10 lakh monthly visitors, of which over one lakh are registered users. In the first quarter of the year, it launched mobile apps and recently introduced an events sub-site Zomato.com/Events. From a team of 22 last year, the company has now scaled up to 85 people and it will reach 300 by September this year. By March 2012, it expects to have 500 people on board, according to Deepinder Goyal, c0-founder and CEO of Zomato.com. Zomato is now ramping up fast, adding five employees per week. Most of the new hires are primarily in sales as the company expands its operations to more cities. It has offices in Gurgaon, Bangalore and Mumbai, and has recently set up operations in Pune and Hyderabad. The company is also opening offices in Chandigarh, Jaipur, Kolkata, Chennai, Goa, Kochi, Surat and Indore. This reflects a renewed focus on tier II cities and reaching out to more towns, instead of its earlier strategy of pursuing international markets. Explaining the shift in strategy, Goyal said, "We had to make a choice of either going international or plunging into events in the local market. We decided to capture events first and continue to grow locally. We will then take the step of launching internationally." According to Goyal, Zomato is now aggressively focusing on its events section. Initially launched to target Delhi, Mumbai and Pune, the events section will reach out to four more cities by end of this month. The start-up is also working on adding online booking features to its site. "We are planning to make a discovery and ticketing platform for events and will also be working with partners to run table reservations and online orders," he added.